The woman who was thrown out of a minibus in an accident and landed on a car near Viseisei Village last Saturday has died. According to Police yesterday, the woman died the same afternoon at the Lautoka Hospital, taking the road death toll to 45. The dead woman is believed to be iTaukei. 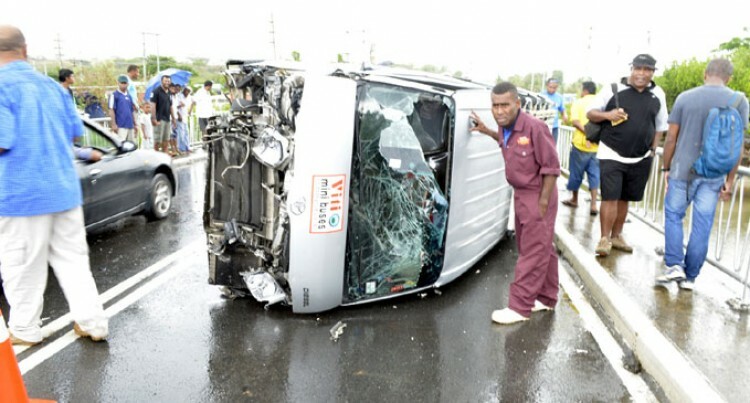 The minivan she was in, while travelling to Lautoka, had overturned three times and came to a stop after hitting the railing of a bridge. The woman was sitting in the front seat at the time of the accident. Assistant Commissioner of Police and Chief of Operations ACP Aisake Tudravu is also appealing for information from the public to identify the woman. “She is believed to be aged between 30-40 years and had boarded the minivan from Namaka,” ACP Tudravu said. Police said three other passengers were treated for injuries and returned home later. The driver has not been questioned yet. As investigations continue, ACP Tudravu says road safety was everyone’s responsibility and people needed to take the issue seriously. “Forty five lives have been lost on our roads already this year and families have had to endure the pain and suffering of knowing they will never be able to spend precious valuable time with the one they love,” he said. He expressed disappointment despite the numerous pleas for the need to be safe on our roads. “Some drivers continue to do as they please and unfortunately another life has been lost,” he said. “It’s never easy to receive reports of road fatalities and relay the tragic news to one’s family, which is why every Fijian must learn that road safety is everyone’s responsibility and that they can prevent accidents from happening.